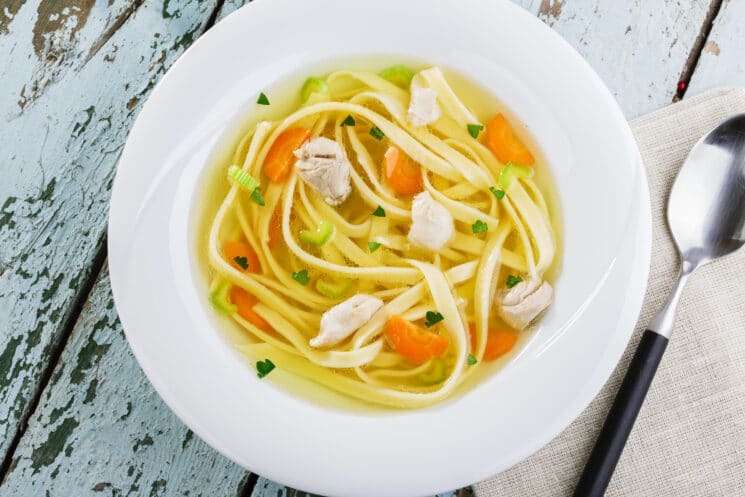 Comforting Homemade Chicken Noodle Soup is surprisingly easy to make, and filled with lean protein and veggies. You can make fresh, whole grain pasta in your own kitchen, with only four ingredients, and without any special tools! 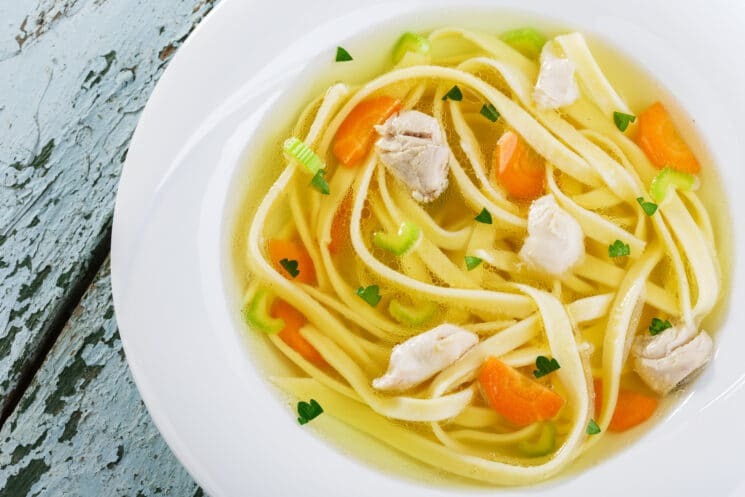 There are a lot of amazing things you can do with homemade noodles, but today we cooked them in a simple chicken soup. We added plenty of colorful veggies, plus a handful of fresh parsley from the garden. Then we all blissed out over the ultimate fall comfort food! If you’re in a dinner rut, or you just want to teach your kids that pasta doesn’t have to come from a box, this recipe is a delicious change of pace. 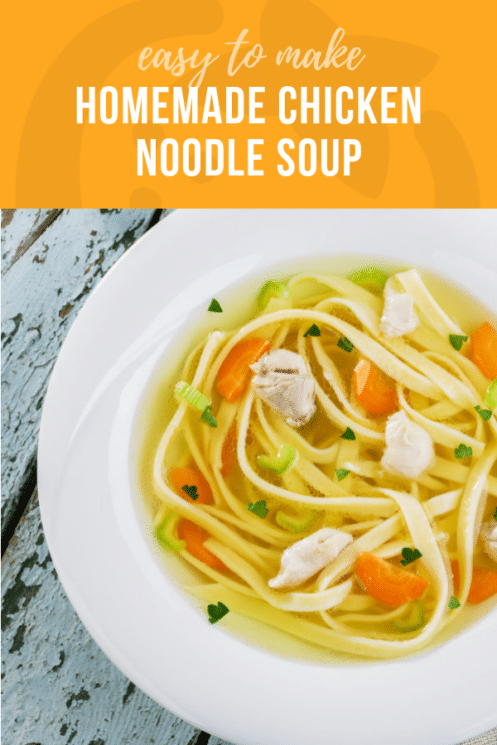 And since these noodles are made from whole grains, whole eggs, and milk, you can be sure your kids are getting lots of fiber and nutrition in their meal… empty carbs these are NOT! Even though the techniques in this recipe are simple, I want to be honest: it’s more a of a Sunday project than a throw-together weeknight dinner. That’s because rolling out the dough and cutting the noodles does take time. But you know what? It’s also pretty fun. And if you’ve got bigger kids who can manage a pizza cutter safely, go ahead and hand over the tools and let them cut some noodles, too! I add the peas just before serving, because I love them to stay bright green… just barely cooked. AND they cool down the soup a touch before I serve it to the kids. Leftovers taste delicious (thermos lunch, anyone?) 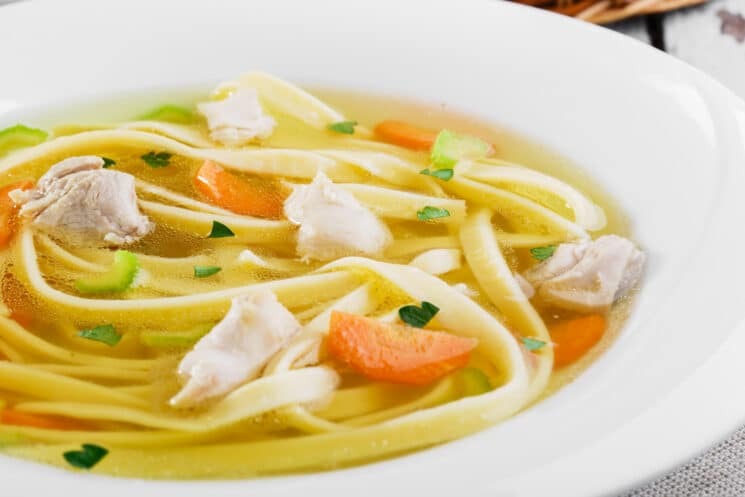 But expect the noodles to absorb the rest of the broth in the fridge overnight. I actually love it like a thick stew the next day, but you could also add an extra splash of broth to make it soupier. Roll out the dough as thin as you can. 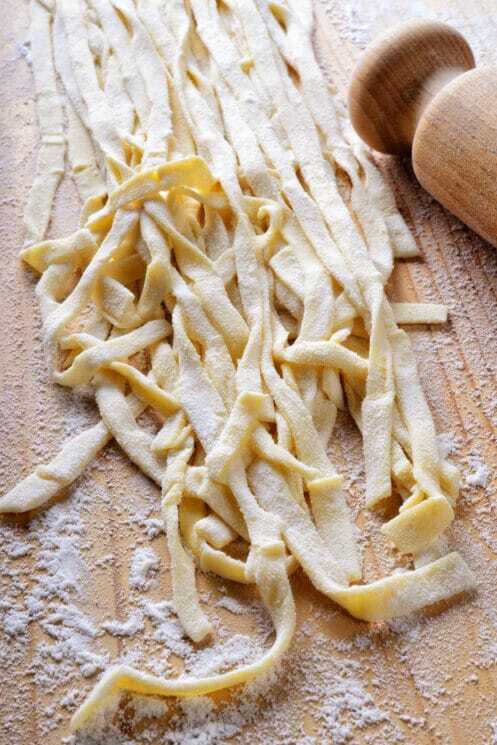 Take a pizza cutter and cut out noodles into long, thin strips. Let the noodles dry for 2 hours. Toss them occasionally while they dry to keep them from sticking. Heat a small amount of olive oil in a large stockpot, and place raw chicken breasts in the pot. Brown on all sides. Add chopped onions and fry for about five minutes, then add broth to cover chicken and onions. Simmer the chicken in broth until tender and cooked through. Remove chicken and cut into bite-sized pieces. Set aside. Add chopped carrot and celery to the broth. Simmer for 10 minutes or until veggies begin to get tender. 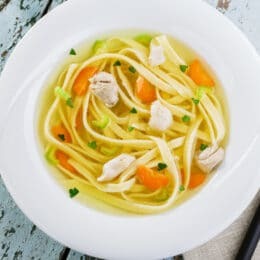 Add noodles to the pot, along with the bite-sized pieces of chicken. Cook about five more minutes, until the noodles are tender. Add peas, parsley, plus salt and pepper to taste. Serve hot. I use Bob’s Red Mill all purpose gluten free flour to make these… cut them a tiny bit thinner and cook them a bit longer than those with wheat flour (to get rid of the bean taste)… but they are so yummy with a rich buttery flavor that my kids actually prefer the gluten free version to the old one!! I always add minced garlic, dried basil and oregano. Garlic is good for you when you’re sick (usually why I’m making homemade soup). And the dried herbs make it look authentic to me (in addition to the flavor)! The ingredients in the “ingredient” section are different than the ingredients in the “direction” section. Most kinda make sense but there is evaporated milk in the ingredient one but just milk in the direction section, which one are we supposed to use? Also there is both whole wheat and white flour in the ingredient section but I only see ww flour used? And there is also water listed in the one section but I dont see it in the directions? I saw this soup being made on insta stories and now wish I could go back and watch it again to clarify! I’m also super confused about this. 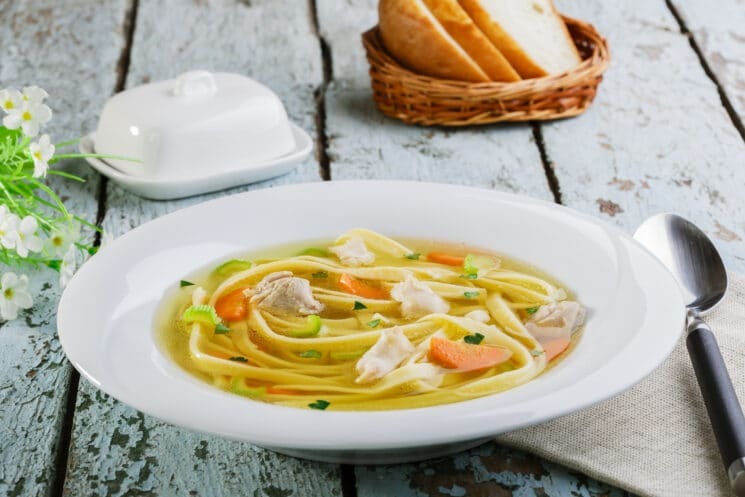 I’m seeing chicken stock and chicken broth both listed and it doesn’t clarify which one to use. I’m in the middle of the recipe now and this is super frustrating! Thank you for post a delicious recipe this is another way prepare chicken with different taste.